Recently I upgraded wordpress from version 3.5.1 to 4.3.1. There are couple of ways you can upgrade wordpress and easiest one is do it using the wordpress ui. It pretty much involves few clicks if things go smoothly. For me it did not work from ui as it got stuck at unpacking stage. These are the quick manual steps which worked for me (on Ubuntu Linux). These were based on the upgrade instructions on wordpress site. rsync -a will ensure file permissions are also preserved. Now take a backup of mysql db. First deactivate all plugins. Before deactivating, note down any already deactivated plugin. This will be useful when you want to activate these plugins again. We will keep wp-config.php file and wp-content directory unchanged. Down the latest wordpress software and unzip it to ~/software/wordpress-latest or some other location. Now copy the relevant files from it to the installation directory of wordpress. 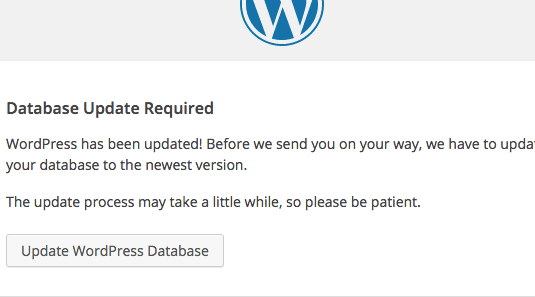 Click on “Upgrade WordPress Database” to finish the upgrade. Now login to /wp-admin and then activate previously deactivated plugins.